Connaught Brown London 2004: Private Collection UK. Exhibited: O'Hana Gallery, Exhibition of Paintings & Sculpture of 19th & 20th Centuries, May - September 1969, Catalogue No.66. 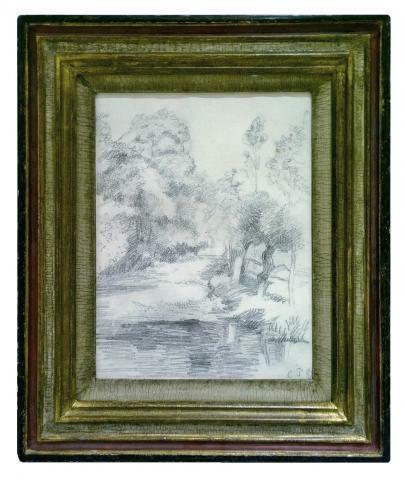 This beautifully detailed drawing was sketched on the banks of the river Epte at Bazincourt near the lavoir or laundry in 1887. A painting with the same title was completed in 1884 soon after Pissarro and his family moved to nearby Eragny, another painting of the same scene 'La Lavoir a Bazincourt' was also done in 1900, now in the Musee D'Orsay, Paris. Pissarro returned to the same spots in the landscape at intervals of days, weeks, or even years, varying his viewpoint to produce the impression of remarkable richness and diversity within an extremely limited stretch of terrain. Joachim Pissarro has concluded, "His representations of these fields and gardens constitute the most spectacularly intense pictorial effort to 'cover' a particular space in his career... His infrequent travels always brought him back to Eragny with renewed resources, fresh ideas, and an eagerness to paint the same and yet ever different locations once again" (Camille Pissarro, New York, 1993, pp. 225 and 241).